As last year’s Bear Art workcamp was a nice experience for both the volunteers and the refuge, we continue the tradition – Bear Art II workcamp is here again with volunteers from all over the world! Participants from Croatia, Italy, Spain, France, Czech Republic, Germany, Bulgaria, Latvia, Taiwan, Poland and Ukraine have arrived to make Kuterevo more colorful together with the camp coordinators – almost local French Amelie and Kristine from Latvia. The camp started on 10th of August – everybody arrived and the challenge of getting to know each other and memorizing each other’s names began. Second day was spent exploring the refuge, learning more about the refuge project, the village and the campaign, and trying to understand the place and its idea better so we could contribute. In the following days we began working around the refuge: painting bear stories and symbols on a mural, on wood, rocks, souvenirs… we are continuing work on the educational trail that was started by the Understanding Bears workcamp just few weeks ago. In the trail, we work on the Meditation Corner, Bear Mythology corner, Animal Track corner, make little fences to mark the trail, paint bear-related names of people and places on the big fences. For this we need to be inspired, so every morning we have meditation time – before breakfast each one of us go to look at the bears, to get to know them better. And this must be working, because during this past week we have created lots of beautiful things here! After the work part of the day we have many other activities as part of the study part – we watch documentaries, play games, we organized a bear talk evening, informing others about bears in our countries, and also had intercultural evening, sharing food, drinks and stories from our cultures. The first half of the workcamp has almost come to an end. It has gone so fast, seems we’ve just arrived yesterday. For some of us it is the first time seeing bears, and looking at them (even meditating with them!) in this idyllic little hamlet between Croatian mountains is so pleasant, it’s easy to forget our everyday lives in the city! In Kuterevo everything is eco-friendly, and you can live in real contact with nature without spoiling or polluting anything. Here we meet and live with people coming from all over the world, and share with them our culture. That’s feeling of a citizen of the world!! Some countries count many bears on their territories, many others have only few left, or none. France is one of these countries where bears have not been welcome for centuries, and where the few still living there (about 20, shared with Spain in Pyrenees mountains) make a lot of troubles, at least in people’s minds and newspapers. But while bears have almost disappeared from forests and mountains, they still keep a very strong place in people’s (French and others) life and in collective imagination, through myths, legends and believes of all times. Stories based on real facts (like bear symbol of renewal because of winter sleep and spring awakeness), reality influenced by stories (bear demonized in narratives and killed through vast hunting campaigns), the history of bears and people is rich and complex… and totally fascinating. Since last October and until the beginning of August, the Natural History Museum of Toulouse, France, presents a very interesting exhibition about this relationship between bears and people “Bears, myths and realities”. On our ways through different projects and lives, two of Kuterevo volunteers managed to meet in Toulouse to visit this exhibition. Following bear tracks in dark corridors, the visit lead us through several rooms: from myths… to reality. Tales and legends from all over the world, etymology of the word “bear” in different languages, symbols and believes related to bears in various cultures, coats of arms, traditional celebrations… step by step, the exhibition takes the visitors through history, and shows how the bear has been a spiritual guide, a magical figure, a creature so close to humans that they could breed together, how he has been admired, hunted and tamed. And how, in a modern world which doesn’t give much space to him, like to any kind of wilderness, people keep looking for tenderness and reassurance with the bear, with the stuffed figure of the Teddy bear. Natural and biological facts follows cultural aspects, taking visitors to another kind of reality: presentation of the eigth species of bears is completed by information about bear conservation and coexistence with humans. The visit is beautiful. One regret: it stays a museum. Lots of information, very interesting facts, great pictures and drawings, everything well documented… but at the end, the feeling that something is missing: perhaps a call to take action, to see more than facts and to think about what can be done. By killing the bear, his parent, his fellow creature, man has for a long time killed his own memory and more or less symbolicaly killed himself. Michel Pastoureau, L’ours, histoire d’un roi déchu. More about bears and people on this blog. Outside her family’s winter hunting lodge, a lone Eastern Cree woman sits, legs crossed, on a birch bark mat. A small black bear skull rests in her lap. Her right thumb is covered with vermilion. She draws it twice across the top of the skull and makes two neat, broad lines. Turning the skull, she makes two red circles on the back with a twisting motion, then two more circles on the upper part of the mandible. She turns the skull to face her again and makes a broad short line across the end of the snout. After wiping the dye from her hands, the woman ties ribbons of caribou hide through the eyes sockets. The ribbons are elaborately decorated with quillwork. “Short tail,” she tells the bear, “you have been treated well here. Tell your relatives what it is like to be killed by my husband.” She stands, holding the skull carefully with both hands and steps into the lodge where her husband sits. She hands it to him. “I am finished” she says. Ritual used by the Eastern Cree, an Indian group of northeastern Canada. Giving Voice to Bear, North American Indian Myths, Rituals, and Images of the Bear. David Rockwell. Highly respected in many cultures, the bear was however often hunted. But this was much more than just a “hunt”. In most of the places where the bear has lived, that was a very important tradition and ritual. The hunting process and the following celebrations were done with extreme respect for the animal and its spirit. The bear was often considered as an ancestor, a spiritual guide or even a god and it was very important to communicate with him. 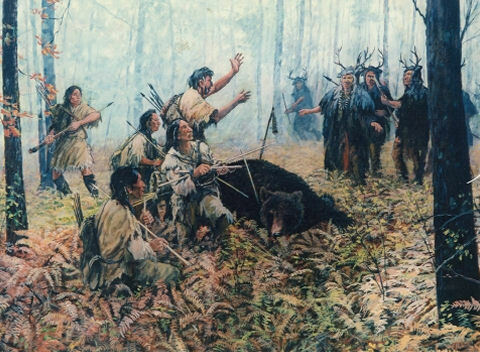 In some cultures, the hunted bear was not even considered as being killed, but as a messenger he would come back to life and bring prosperity to the tribe (especially good hunt, what was necessary to feed the people) if the ritual was done correctly. Icon of several generations of children who grew up reading, listening to or even watching the “Jungle book”, Mowgli was raised in the jungle by wild animals. If the panther Bagheera has an important role in the young man education, it is the bear Baloo who stay the main figure in the teaching process. From all animals in the jungle, it is from a bear that Mowgli learnt how to survive, to feed himself, to swim, to climb… Like in the believes of many tribes and pagan cultures, the bear is the one holding the knowledge of the forest. My name is Sdipp-Shin-Mah (Fallen from the sky). I am Flathead. I am going to tell you now about the time when the grizzly spirit gave me its power. One day when I was a girl just about six or seven winters, my mother told me we were going berrying in the mountains. We rode double on her horse and went high into the mountains. It was getting late in the evening. I saw a patch of bushes. I told my mother, “Look, there are some berries and plenty of them”. She spread out my robe, and I sat on it and began eating. She got on the horse and reminded me to stay where I was, and she said she would be back soon. She disappeared in the bushes. I was not afraid. I ate berries and talked to myself about the trees. Then I saw night was coming and my mother was not yet back. I became frightened and called for her. I called for my mother but saw no sign of her. I called and called while crying, not knowing what to do. I just cried and cried and called for my mother all night. But there was no use. She had left me and went back home leaving me alone in the high mountains. When I could not cry any longer, I got up and took my robe and walked bot knowing where I was going. It was still night and very dark. I went on until I got tired and sleepy and lay down and went to sleep. When I woke up then sun was way up already, and it was nice and warm. At first I thought I was sleeping with my mother at home. Then I remembered I was high in the mountains, and my mother was not there. I started to cry again. When I stopped crying I began to walk and eat the berries growing there. I kept until I got to a deep gulch fully covered with trees. While I sat there I thought of my home and my mother. I began to cry again. Then I barely heard a sound that I thought was human voices. I listened closely but heard nothing and thought it must be the cry of a bird or something. Then I heard a sound again, and as I listened I heard it again and again and knew it was the sound of humans laughing and talking loudly way down in the bottom of the gulch. I could not see them as it was covered all over with trees and bushes, but I could tell they were coming toward me. Just where I was sitting was on a ridge and below on the hillside was an open bald place. The sound came from that way and I was watching closely and was surprised with joy to see a woman with two little ones coming. I thought it was someone from my tribe. They were running and chasing each other. Laughing and shouting, they came pretty close. I saw the woman was a very handsome woman, well clothed all in buckskin and clean. One of the children was a boy and one was a girl. They were also well dressed, all in buckskin. Then she told me this: “Listen closely. I am going to give you medicine power by which you will be a great help to your people in the future. This time will come after you pass middle age. But do not try to do more than I am allowing you or granting you because, if you do, it will be nothing more than false and you will be responsible for sufferings and even death. One of my gifts is that you are going to be helpful to women especially those that are having hard times and suffering giving birth of a child.” She said this. Then the grizzly bear mother and her cubs took me back to my people. In Giving Voice to Bear, North American Indian Myths, Rituals, and Images of the Bear. David Rockwell. In this story, Sdipp-Shin-Mah was not shaman, but, like a shaman, she possessed an animal spirit helper who gave her powers that she used throughout her life. In Indian tribes believes, animal spirits were principally obtained through dreams and visions. According to various tribal accounts, the bear also knew how to heal himself and so to be a master healer. Thus, many tribes (Cheyenne, Eastern Cree, Penobscot, etc.) have believed that it is possible to learn what plants are beneficial to human health only by watching what the bear eats. 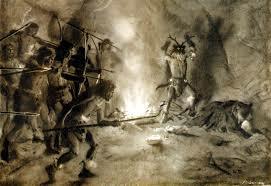 They also believed that their Shamans, sometimes called “bear doctor”, received their healing powers from bears. For the Tewa tribe (American Indians), the word kieh, or “doctor”, is even synonymous of “bear” (more in the article The medicinal bear). One time I was hunting. It was sunrise in the spring and I was looking for buffalo, climbing over hills and looking. I came on a bears’ trail. Lots of tracks. I followed them to where the bears stood gathered by a tree, and I watched. They were performing a Sun Dance. I hid with the wind in my face so they could not smell me. Bears are wicked animals when dancing! If they had seen me, they would have hunted me for miles. They danced in front of a pine tree painted yellow, red, and green. They made four steps forward and four steps backward, all the time they were looking at the pole. They also sang, and their singing was a growling. They had built a midnight fire there. One of those bears was a puhagant, a medicine man. He made the fire. Bears have puhagant just like people. When they dance they pray for their children. Bears are smart. They act just like a person. Adapted from Hultkrantz, Belief and Workship. People have told about watching real bears dancing in the wild. Once a man went out in the fall just before the first snow to hunt for a bear. The weather was cold. He found a bear hole at last, killing the bear and skinning it. Then because it was so cold he crawled into the bear hole which seemed like a nice place to stay overnight. He piled grass over the opening to keep out the air and went to sleep. When he woke up from time to time, he turned over. At last he woke up, but he felt strange. The flesh of his face was drawn tightly over his cheekbones. He listened for a moment and could hear flies at the door. It was spring. “Did I sleep all winter” he asked himself. That is why people do not go into bear holes. The end of the year is coming, already the cycle of seasons took us to winter and Kuterevo is once again cover with snow, showing another face of the village quiet beauty. And in the silent valley, we do not hear birds anymore, we meet less and less people in the streets, and very soon the bears will as well “disappear” from our daily life, entering in their winter sleep. From immemorial times, and in many different cultures from all around the world, the bear has been a symbol of the seasons. As the days are getting shorter, as the nights are getting colder, as food is getting more and more difficult to find, the bear is looking for a place where to sleep. This mysterious disappearance of the large and strong animal has always been fascinating people, and numerous myths and beliefs were born, often linking this long sleep to the idea of life and death, resurrection or simply cycle of life. The bear, master of the seasons, symbol of renewable and annunciator of the spring (see previous article), has been seen as a guide, an ancestral figure telling us how to live with nature. In the coming weeks, when the bears will be in their winter dens, we could as well take some time to take a breath and try to remember how once our relationship was one of mutual respect. Through myths, tales and legends, we have the chance, if we want to, to see the world with other eyes, looking for the lost knowledge hidden behind these stories. … we can hope that when the spring will come, we will, like the bear, open our eyes and reborn in the blossoming world, aware of its natural beauty and ready to stand for it.